I LOVE going on the train – we usually only travel on short journeys of about two hours to Cardiff though. It can be tough keeping children occupied on long train journeys. Here are some top tips for travelling by train and to help make the journey a lot smoother. Us children and long train journeys very often don’t go too well together. It can be pretty difficult trying to keep us busy when you are on a long train trip as we tend to get grumpy and bored easily. As well as hoping we sleep and feeding us regularly, there are a couple of other ways to keep us occupied during a long trip. It may be tricky but try to be patient and take your child for regular walks. You’ll probably definitely hear the question, “Are we there yet?” quite a few times, but don’t lose patience. Little ones have a tough time sitting still in one place for a long time, and they get anxious about how long exactly they will have to sit in that same place. Take them for regular walks inside the train. Get them to stand with you at the door for a while and take in the views. See what you can spot together. An old but good game – Eye Spy – not only to find named things, but colours or numbers, a bit like hide and seek, if your child is young like me. Say you can see something that is purple, and ask can they spot it. Other good word games are to each choose a letter and see how may things you can see beginning with that letter, and story telling – start a story with one sentence, and the others have to continue the story, each with one sentence at a time. Play-doh is a great way to keeping children busy on the train. Board games can get a little boring after a while, but Play-doh is a lot more interesting and far more creative, so it is better at keeping children occupied for long periods. Bring along a range of different colours and let your children create new characters. Allow them the time to make whatever they want to and to help them too. This creativity will help pass time. Draw a town and create a story for your children. Take a notebook on board with you along with crayons, toy cars and other figurines to help bring the story to life. Draw a small town and add a market place, school, amusement park, houses, a circus and so on. Then get your child to “drive” through the town and help them to plan a day and make the ride fun by creating car chases. Go a step further and help your child create a book. Take a pile of papers, fold them together and create a DIY book. Take a range of pencils with you and get your child to fill the book with all his or her favourite things, such as flowers, animals, Superheroes and so on. Then help them to create a fun book cover with their name on it. Forcing your child to sit still in one place when he or she wants to do some activities while on the train will end up making him or her pretty grumpy. Just remember to keep an eye on your child. 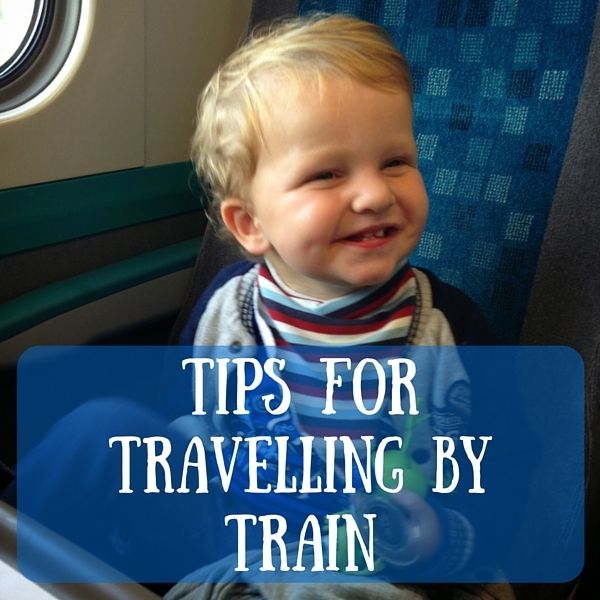 Follow these tips for travelling by train and you will soon be there! Do you have any tips for travelling by train? Travelling with kids on transport in general can be difficult but I agree that talking walks or preparing them beforehand definitely helps! We travel by train quite a bit and have actually just completed a trip to London and back with three kids from Newcastle this Easter. My three children are older now and love playing on their iPads. I would also recommend a train picnic! Mine love the train – we even took a sleeper train to Scotland recently. Great tips. I find looking out the window and talking about the world going by is great fun. These are actually great tips for travelling with kids. I know my younger cousin got frustrated when we took a 2 hour train journey to a concert for her. I love travelling by train, even when it is ultra busy. I always have but I’m not sure why, maybe it’s because it’s a rarity. Great tips we don’t use the train that often but when we do its only a short distance usually. I’m hoping to go out more though this summer.